We often refer to Post-it notes as portable recording devices, just to put in perspective why we stick to using them. It’s one of the easiest, fastest ways to get a group of people to put their thoughts together and then sort them out, collectively. 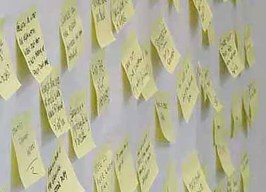 Quickly, a group can organize a wall of hundreds of Post-it notes, revealing major themes but keeping the granularity intact within the resulting categories.